Cattle prices are right for upgrading your herd. So, adding heifers is on the minds of many cattlemen. Our first recommendation is to invest in a great Angus bull and raise your own replacement females since they will be adapted to your operation. Look at your mother cows and identify the most fertile, moderate sized with excellent feet, legs and udders. The largest heifer may not be your best to keep as a future cow. How was her birth weight? Did her mother have any calving problems? Does the mother have good maternal instincts and disposition? Heifers need to be on a different nutritional diet than steers or cows. We try to adjust gain to about 1.75 pounds per day. Fat heifers look good, but remember you are not sending them to market, but growing them. Young heifers can deposit fat in their udders, which will decrease future milk production. Use corn sparingly if you use it at all. High quality free choice hay has worked best for us. Sometimes we might feed 2-3 pounds of corn just to train them to come when we call. Do not rapidly change their diet. The stomach rumen takes about 2 weeks to adjust to diet changes. Don't forget clean fresh water and a mineral program. These heifers are like young teenage girls needing a very healthy diet in order to develop to their potential. A good vaccination program will also help to keep them healthy in the developing stages. Once they are cows, their immune system will be much stronger. Selecting from your herd may not be an option. Rule #1 -- ALWAYS BUY FROM A REPUTABLE OPERATION! If you break this rule you are on your own. Good luck and prayer are your only other options. Always buy bred females, rather than open heifers, and use an independent third party to verify the pregnancy. Be sure you know the sire is easy calving and has an EPD for Calving Ease of +7 or above and a birth weight EPD of +1.8 or less. We also recommend the sire have an actual birth weight of 85 pounds or less. The heifer should weigh 850 pounds when bred. This will allow her to have enough size to calve a 70 plus pound calf with no problems. Physically evaluate the heifer you are about to purchase. Don't confuse fat with muscle. Bulls need lots of muscle, not heifers. Heifers need to look feminine with sleek tight briskets and somewhat narrow neck lines. They should have a very feminine look and not look like a steer with a slick hair coat in summer. Watch as the heifer walks to see if her back feet follow the front steps. She should also look healthy with an alert look, yet not overly flighty. Choose females that are raised under similar conditions to your farm. If you are breeding in June and July, select for heat tolerance, (avoid cattle bred in the northern tier states). 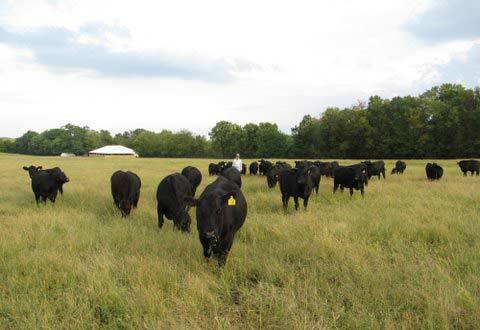 If you have fescue pastures, look for fescue tolerance, as well. Cattle that move from one climate to another, will take many months to adapt.